According to today's Daily News, New York City is on the verge of booting any car whose owner has $350 or more parking tickets in judgment. The city has chosen private company PayLock to handle the boot system, and has been working on getting the Finance Department's customer payment website ready for boot payments by Tuesday. Finance commissioner David Frankel says the new system will "facilitate debt collection while also reducing inconvience to motorists." However, internal agency documents show that while the new system may be less convenient to drivers than having their cars towed, it comes with fees to remove the boots at a cost of $300+. The new program sends a city marshal (who will verify the car has over $350 in judgments against it and authorize a boot) along with PayLock employees to apply the boot. The vehicle's driver can then call a toll- free number to pay off the tickets by credit or debit card, or travel to a city payment center and pay with cash. Once the bill has been paid, the driver is given a code that will allow him to remove the boot. The cost of removing the boot will be $180 for PayLock's boot fee, $70 for the marshal's execution fee, plus a poundage fee of 5% of the entire bill, and if paying by credit card, an additional convenience fee. 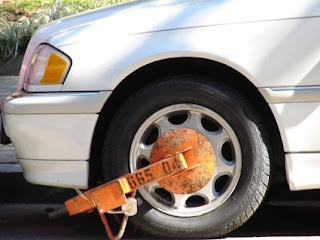 If the driver doesn't pay within two days, the booted car will be towed and charged the $180 booting fee PLUS the $185 towing fee. Forgetting to return the boot to a city payment center within 24 hours will run drivers another $25 per day, up to $500. Moral of the story? Don't ignore your parking tickets- two $115 parking tickets can balloon into almost $700 if you end up with one of these boots. Need help fighting your tickets? Contact us today!